10M All Mode Transceiver New. did not have ,ideal for the 10 metre user on a budget. Small and compact, great for mobile or home use. 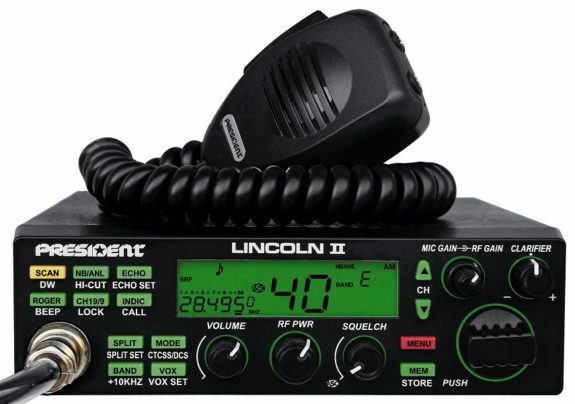 “No ham radio operator should be without one of these sets”. President Lincoln 2 Rotary switch and Up/down channel selector. (continuous scanning of 28.000 Mhz to 29.700 Mhz). – Volume adjustment and ON/OFF. – Manual squelch and ASC. – Vox function (Hands free). – ANL filter , NB and HI-CUT. – RF Gain / Mike gain. – Channels and memories scan. – SWR (Power Reading /SWR). – TOT (Time Out Timer) adjustable.